If you have been reading this blog for a long time, you probably know that 5 years ago I found a newborn puppy in a garbage can and that I adopted her. Ever since we have become inseparable! (read the story here). Before I get married people used o tell me that I would forget all about Gioia the moment I would become a wife! Then before giving birth to my prince they kept telling me that when my sprout would show up, I would not care about my dog any more…They were so wrong! After 2 years of marriage and the birth of my son I still care about my beloved Gioia and whenever something bad happens my heart breaks. She underwent a surgery 2 days ago and I was so worried about her. Seeing her laying on her mat, tired and in pain is so painful for me. Dogs are wonderful beings and I feel so lucky to have her in my life. I hope she gets well soon! Let’s move on to th recipe now. 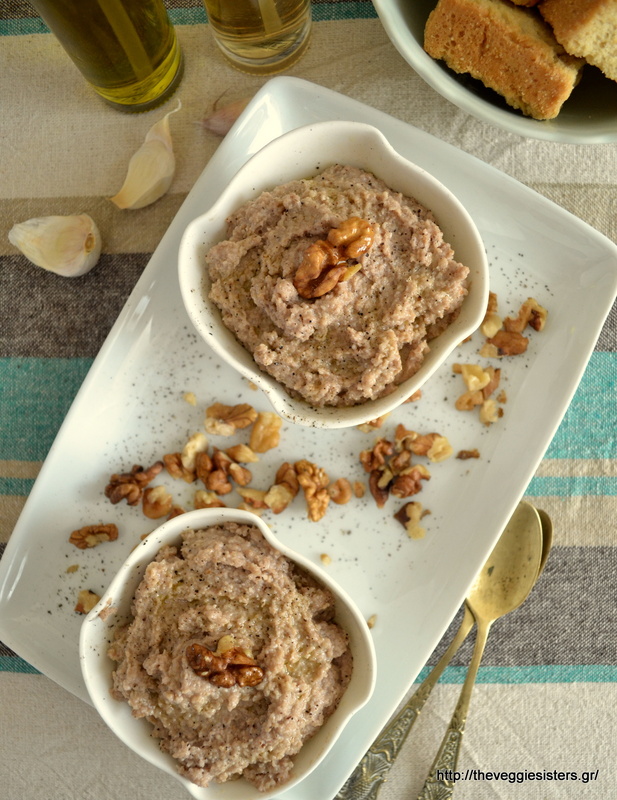 Today we are making a greek traditional recipe called skordalia. It is a potato and garlic dip. I decided to make its most popular variation that is skordalia with bread instead of potatoes. It is amazing! If you are a garlic fan like me, you will love it! It pairs well with boiled veggies (especially beetroots), grissini, rusks. It is so easy and quick to make! You should try it! Have a lovely day, friends! Happy weekend! Soak bread in water for 10′. Then in a blender pulse walnuts with garlic. Add the rest of the ingredients. In the end squeeze bread so that water is removed and pulse it too until well combined. If you want it less thick, add more water. Put the spread in a jar and store in the fridge. It keeps well for days. Enjoy! Share the post "Garlicky bread spread (skordalia)"